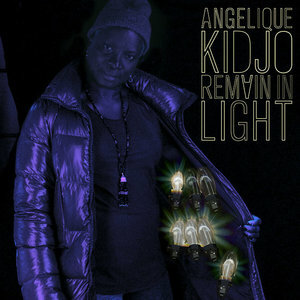 Angélique Kidjo takes on a classic Talking Heads record with grace and aplomb on Remain in Light. Almost 40 years ago, the Talking Heads released Remain in Light, an album marked by experimentation with polyrhythms and funk; the band explicitly credited Fela Kuti's music as a strong influence on its general sound. On her new cover of the album, Beninese singer Angélique Kidjo pays tribute to both the album itself and these Nigerian influences, even featuring Afrobeat co-founder and master drummer Tony Allen on "Houses in Motion" and "Crosseyed and Painless". More than rehashing the styles of other legends, though, Kidjo makes Remain in Light her own, constructing a version of the record that is entirely her own, a vivacious take on a group often known for their ability to sound detached from humanity. Opening track "Born Under Punches" lets Kidjo's voice burst forth in an a cappella introduction that leads to a cover whose riffs remain largely unchanged from the original song. Kidjo's powerful voice both takes center stage and makes up layers of background sound, and the song makes for a perfect introduction to the diva herself, though it only scratches the surface of what she can do with the Heads' work. For that, we move on to "Crosseyed and Painless", where Tony Allen's distinctive percussion style lends a feeling of perpetual motion to the track that drives the song in a new direction. Kidjo has the fortitude to stay in front of the drums and match the horns blast for blast, turning the track into a brassy funk jam. Already a high-energy highlight, "The Great Curve" becomes unstoppable when Kidjo arranges it. Beginning with quick vocal chants, the song includes a piercing guitar solo from multitalented artist Devonté Hynes (known for his solo work as Lightspeed Champion and Blood Orange, among work with artists ranging from Tinashe to Blondie). Looping guitars, bass, and drums keep the speed high while Kidjo brings out a fighting feminine spirit inherent in the lyrics ("A world of light / She's gonna open our eyes up"). By far the best-known cut from Remain in Light, "Once in a Lifetime" is bound to be a focal point for most listeners. Kidjo's warm timbre takes the song from hauntingly existential to something near celebratory, accompanied by vibrant horns and jangly dance pop guitars. She embraces letting the days go by, and when the water holds her up, it's the way she wants it - there is no helplessness as she marches forward, leading a parade of musicians in her wake that includes bassist Pino Palladino and drummer Charles Haynes. The album's approach to "Houses in Motion" may be the most reflective of what Kidjo brings to Remain in Light as a whole. She executes the intro and other spoken-word moments in one of the many non-English languages she speaks fluently. Her golden voice then turns the track into a heartfelt ballad. It's completely sans a sense of irony, and more authentic to Kidjo's entire body of work for that sincerity - and this willingness to embrace fullness of atmosphere and feeling is the true mark Kidjo leaves on her rendition of Remain in Light. "Seen and Not Seen" exemplifies this difference. The Talking Heads' original version of the song is a stark and melancholy tune, twinkling with sparse electronics. Kidjo turns it into a story, telling it with wonder and enthusiasm. The electronics become stars, the mood goes from wistful to comforting between narration and lyric. "Listening Wind" once again takes a song made beautiful by its chilling and distant qualities and thaws it, transposing it into a warmer palette and adding twangs of mbira. Her voice is at its most nimble here, exuberant and poignant. The album ends with "The Overload". Here, instrumentation is stripped down nearly to the point of ambience, and Kidjo and her band pay homage to the Talking Heads' intrinsic weirdness with loose rhythms and notes that spring up almost unpredictably until the end of the piece, when strings, horns, and voice finally come into soft unison. Angélique Kidjo and the Talking Heads are a match made in musical heaven, each inspired by sounds from around the globe and capable of blending them into high-energy works of sound unlike any others. By taking on Remain in Light, Kidjo brings her finely honed Afropop sounds to one of the 1980s' most iconic new wave albums, packing just as much of a punch as the Talking Heads ever did - no small feat for most, but all in an album's work for Angélique Kidjo.